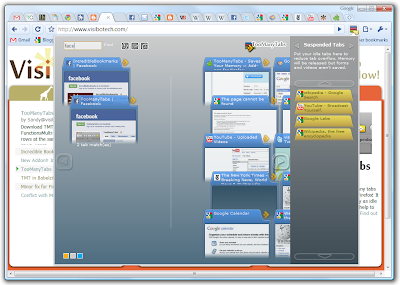 From the makers of TooManyTabs for Firefox, TMT has come to Chrome to help all your tab needs! This is a beta preview version before official launch of Chrome extensions. Constructive feedback welcome at contactus@visibotech.com, or in our facebook forum. Certain functionalities of TMT in Firefox are not available in Chrome Version. Some of them not possible at all yet in Chrome, while some are deliberated redesigned to fit Chrome's usage-flow. If you are a veteran of TMT Firefox please give us some feedback! Why can't the chrome version use the same bookmarks to store columns and suspended tabs? 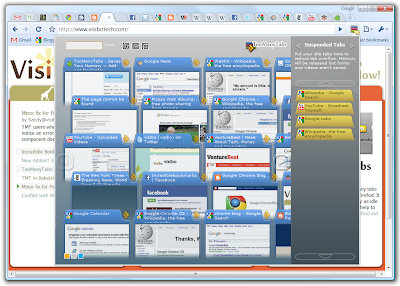 I sync my bookmarks between browsers using xmarks and it would be great if I could see my suspended tabs from firefox. @Jeff: Please use "FreshStart" extension in Chrome http://goo.gl/249h). Since the sessions can't be actually synchronized between Firefox & Chrome. TMT for Chrome is more suitable for active tab management.